It has been 20 days since the launch of Wiki Loves Monuments 2016 and it is time for an update on what we have achieved together. In the majority of the more than 40 participating countries the photo submissions are accepted until September 30. So far, more than 120,000 photos have been uploaded by 5741 participants as part of the contest in 41 participating countries. The highest number of uploads comes from Germany with more than 27,000 photo uploads (more than 50% of them by User:Tilman2007) while India is on top of the chart with 1196 unique participants! Compared to last year this time, the total number of photo uploads have increased by more than 10%. In the same period, the number of Wikimedia accounts created right before uploading a photo to the contest (a strong signal for the number of accounts created as part of the contest) has increased by almost 80%! While it is too early to showcase the usage of photos uploaded as part of Wiki Loves Monuments 2016, it is nice to see that some of the participating photos have already been added to more than 3400 pages on Wikimedia projects. We know that historically the majority of the photos have been uploaded in the last week of the contest. With less than 10 days left in the majority of the participating countries, now is our last chance as the WLM local organizers and enthusiasts to get the word out about the contest, organize local tours and photo upload events, and more. Remember that all it takes to participate is to find a monument near-by, photograph it, and submit a photo of it for the competition. You can win a prize and help Wikipedia. For more statistics about the contest, please check wikiloves or wlm-stat. Photo: Saint Samaan The Tanner Monastery in Cairo, Egypt. By: Hoba offendum, CC BY-SA-4.0. 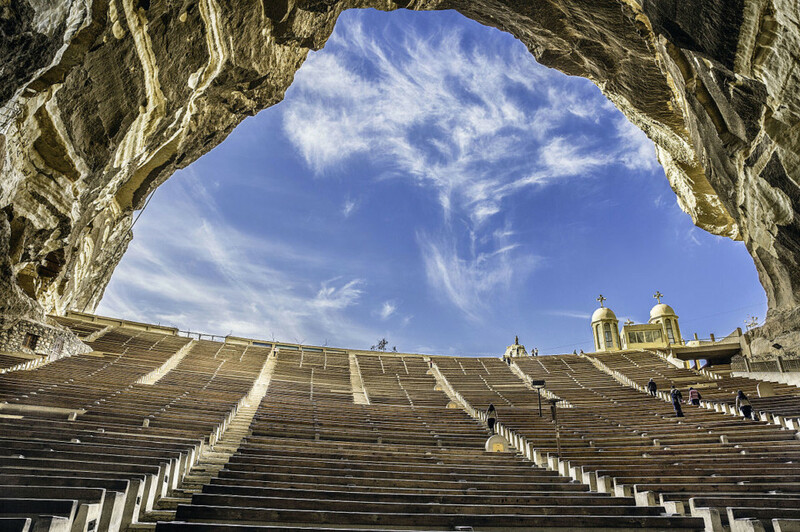 What is the location of this amazing arched amphitheater? It is Saint Samaan The Tanner Monastery in Cairo, Egypt.